Between 1986 and 2005, greenhouse gas, methane and nitrous oxide emissions in agriculture were reduced by 13.4 %. A decrease in population of cattle and poultry, as well as modernized slurry treatment systems in large pig farms contributed the most to the reduction of these emissions. The indicator presents the trends of methane (CH4) and nitrous oxide (N2O) emissions in agriculture. Both of these are greenhouse gases. There is an increasing amount of evidence that greenhouse gases contribute to the rising air temperature and thus to the global climate change, which is affecting the natural environment and causing significant damage to economies, especially to agriculture. Due to global warming, we can anticipate ever more frequent droughts, as well as an increased probability of storms, frosts, hail, floods, landslides and other, less common weather events. Some areas may experience problems with water supply. 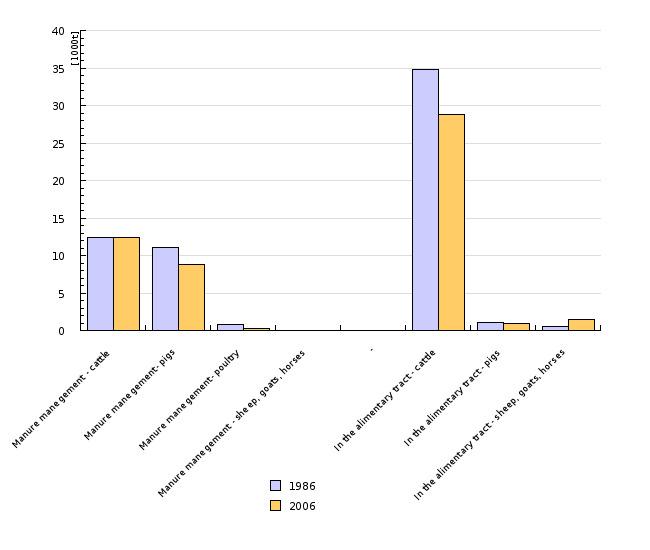 The data are presented relative to the base year 1986, which is the basis for the calculation of Slovenia’s obligations to reduce emissions of greenhouse gases. They were estimated in accordance with the IPCC (Intergovernmental Panel on Climate Change) method, taking local specificities of farming methods into consideration. Methane and nitrous oxide are the only greenhouse gases monitored with regard to emissions in agriculture. Due to the differences in greenhouse effects, they are calculated into equivalents of carbon dioxide. The greenhouse effect of methane and nitrous oxide is 21 times and 310 times stronger than the effect of carbon dioxide, respectively. According to IPCC method carbon dioxide generated by the use of fossil fuels in agriculture is not monitored within the agricultural sector. Thus it is not the subject of this indicator. 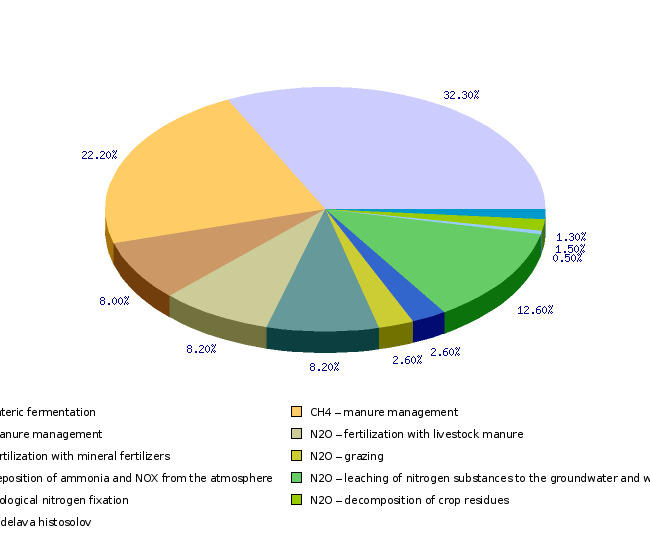 Greenhouse gas emissions in agriculture are direct (for example methane emissions from enteric fermentation and manure management, nitrous oxide emissions from manure management, fertilization with livestock manures and mineral fertilizers, grazing, biological nitrate fixation and degradation of crop residues), and indirect (for example emissions due to deposition of ammonia and NOx from the atmosphere, and due to leaching of nitrogen substances to the groundwater and watercourses). Environmental Agency of the Republic of Slovenia, 2008; European Environment Agency, 2008. Slovenia signed (1998) and ratified (2002) the Kyoto Protocol and thus made commitments to implement the measures for the reduction of greenhouse gas emissions and to limit the emissions by 8 % by the first target period 2008–2012 in comparison with the base year 1986. This is a general commitment and applies to all sectors (energy, industrial processes, use of solvents and other products, agriculture, changes in land use and forestry, waste and other). As there are no individual sector goals, iot is considered that the same commitments apply to agriculture as well as to all other activities. Methane is generated during the fermentation of feedstuffs in the digestive tract of domestic animals and during livestock manure storage. Due to the relatively large herds and specific digestion, cattle production is responsible for about 80 % of methane emissions in Slovenia. The most nitrous oxide is generated during livestock manure storage and due to fertilization with livestock manures and mineral fertilizers. Indirect emissions due to nitrogen leaching to the groundwater and watercourses also contribute a large amount of nitrous oxide. Between 1986 and 2005, annual emissions of methane in agriculture decreased from 60,700 tons to 52,300 tons, or by 13.9 %, and emissions of nitrous oxide decreased from 3,324 tons to 2,826 tons, or by 12.9 %. In the same period, the greenhouse gas effects of both gases, expressed in CO2 equivalents, decreased from 2,305,000 tons to 1,996,000 tons, or by 13.4 %. Slovenia is as successful as the EU in its endeavours to achieve the Kyoto goals in agriculture. In absolute terms, cattle production contributed the most to the reduction of greenhouse gas emissions, where methane emissions due to the enteric fermentation and nitrous oxide emissions generated during the livestock manure storage decreased significantly. The reduction is attributed mostly to the improved efficiency in cattle production, since a similar extent of production is achieved with significantly smaller herd than in the past. New slurry treatment devices on large pig farms made a considerable contribution to the decrease in the greenhouse gas emissions. With the introduction of more efficient slurry separation methods and construction of anaerobic digesters for biogas production, methane emissions during storage of pig manure per housed animal were reduced by about 20 %. Emissions in poultry production decreased significantly as well. The decrease is on account of a reduced extent of production. Greenhouse gas emissions did not increase in any important agricultural source. A large increase in emissions from small ruminants has no significant effect on total emissions due to its small share in the structure of emissions. The increase in emissions from grazing animals is not problematic either, because increased number of grazed animals reduced the emissions from stables and manure storage facilities. Slovenian legislation does not treat greenhouse gas emissions in agriculture separately. Exceptions to the rule are large pig and poultry farms, which are obliged to function on the principle of the “best available technologies” by the end of October 2007 in accordance with the IPPC directive. Individual regulations intended for the protection of water and land indirectly protect the atmosphere as well, for example the Decree on the limit input concentration values of dangerous substances and fertilizers in soil. Agri- environmental measures that were first implemented in 2001 in the framework of the Slovenian Agri-Environment Programme and became included in the Rural Development Programme in 2004 also indirectly contribute to the reduction of nitrous oxide emissions. 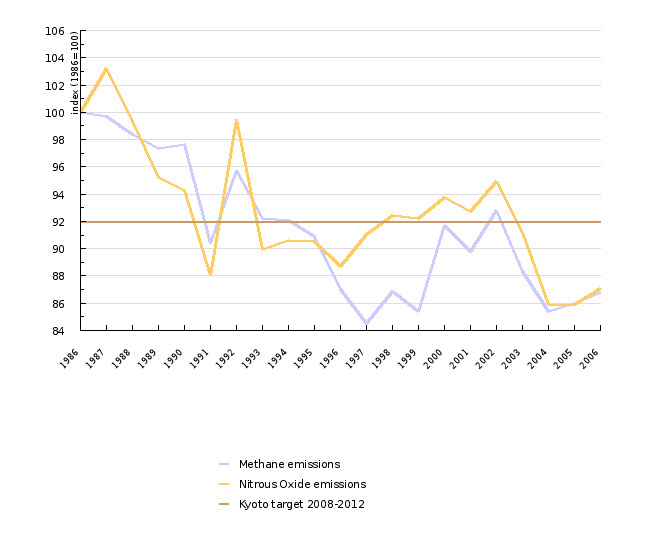 - Atmospheric Emissions of Greenhouse Gases From Agriculture, Environmental Agency of the Republic of Slovenia. As a signatory of the UNFCCC (United Nations Framework Convention on Climate Change), Slovenia is obliged to keep records of greenhouse gas emissions and report on them on a yearly basis. These records are kept by the Environmental Agency of the Republic of Slovenia. The Secretariat of the Convention regularly monitors the accuracy of recordkeeping and regularly reports on the findings. Emissions estimates are prepared in compliance with the IPCC (Intergovernmental Panel on Climate Change) method and take local conditions into consideration. Input data on the extent of agricultural cultivation and production are taken from statistical yearbooks and special publications by the Statistical Office of the Republic of Slovenia. Emission factors for the more significant methane and nitrous oxide sources were defined in the framework of support studies at the Agricultural Institute of Slovenia, where a simplified methodology for the assessment of greenhouse gas emissions from agriculture was generated (2003) for the needs of recordkeeping. They took into account numerous expert estimates on animal feeding, housing methods, and methods of collecting and storing livestock manure. The lack of reliable quantitative data on farming methods is the weakest link in the estimates of methane and nitrous oxide emissions. 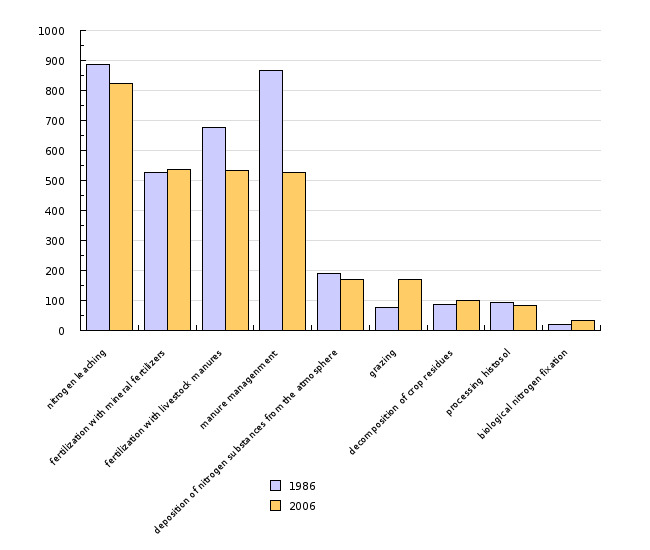 Annual European Community greenhouse gas inventory 1990–2003 and inventory report 2005 – Submission to the UNFCCC Secretariat, European Environment Agency, 2005.